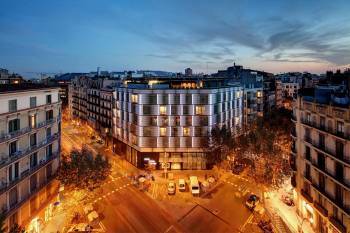 Olivia Balmes Hotel is a modern city hotel, designed and built to satisfy the most demanding guests. With a 4-star superior rating, the hotel has 128 rooms, 4 meeting rooms with capacity for 200 people, restaurant, bar, terrace, solarium and pool. All of these services combined with exquisite guest services from all Olivia Hotels staff will make your stay unforgettable.- 128 rooms starting at 25m2.- Professional, personalized service.- Wide variety of quality 4-star superior services.- Free Wi-Fi throughout the hotel.- 1000m2 of space for all types of events.- Outdoor pool in the heart of Barcelona.- 500m2 terrace available for customized event.